Tailor-made for simple, reliable performance day in and day out, the BenQ MH535FHD combines the brightest big-picture quality and ease of setup for most sized rooms. With a standard 3 year warranty and an affordable price, this home theater projector is unbeatable compared to our competitors. Made for simple, reliable performance for your home, day in and day out, the BenQ MH535FHD combines bright big-picture quality, intuitive hassle-free operation, and convenient digital connectivity with environmentally conscious power savings and budget-friendly cost. 3,600 lumens of high brightness provide comfortable lights-on entertainment in well-lit meeting rooms. The high luminance boosts picture quality with vibrant color for pictures and videos as well as crisp text and fine details. Powerful 15,000:1 native contrast enabled by state-of-the-art DLP technology and all-glass 5G optical lens systems deliver ultimate clarity, smooth gradational mid-tone color transitions, and razor-sharp scenes. Dual HDMI inputs in addition to dual VGA inputs make it easy to connect to your favorite movie, event or game. Multiple, standard inputs make setup less complicated and saves time for your family to get to the fun. Countering the trapezoid effect when the projector must be placed off-center, such as simple placement on top of a table, the vertical keystone function adjusts the image for a perfectly squared image. Keystone correction makes it simple to project ideally aligned images from a variety of locations. A sleek, compact design with a sculptured patterned cabinet resists dirt and fingerprints as the projector is moved from one room to another. The intuitive keypad and remote control layout simplify picture adjustment to the next room you move the projector too. Far superior to projectors with only one adjustment foot, the triple adjustment feet significantly enhance flexibility in a wide variety of meeting rooms, with the additional feet placed in the corners or the projector to facilitate easy movement. Conveniently placed on the top, an easy-to-open lamp door allows fast lamp access, maintenance, and replacement for uninterrupted productivity whether the projector is placed on a table-top or ceiling mounted in meeting rooms. The quick-access lamp door significantly reduces downtime by eliminating the need to uninstall mounted projectors, making lamp changes a quick and simple process. 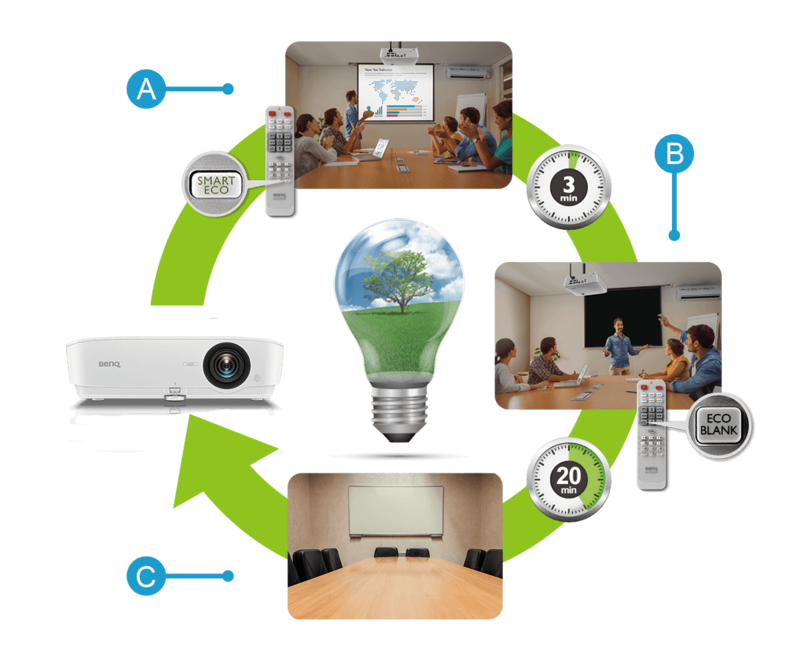 The BenQ Eco-Cycle System eliminates electricity waste, reduces power-up wait time before and after meetings, and minimizes maintenance for a lower total cost of ownership. C. Auto Power Off: The MH535FHD powers down after 20 minutes of inactivity to eliminate energy waste and concerns of leaving the equipment on. When inactive, the BenQ MH535FHD keeps power consumption to a minimum with 0.5W standby power, maximizing energy savings when the projector is connected but not in use.